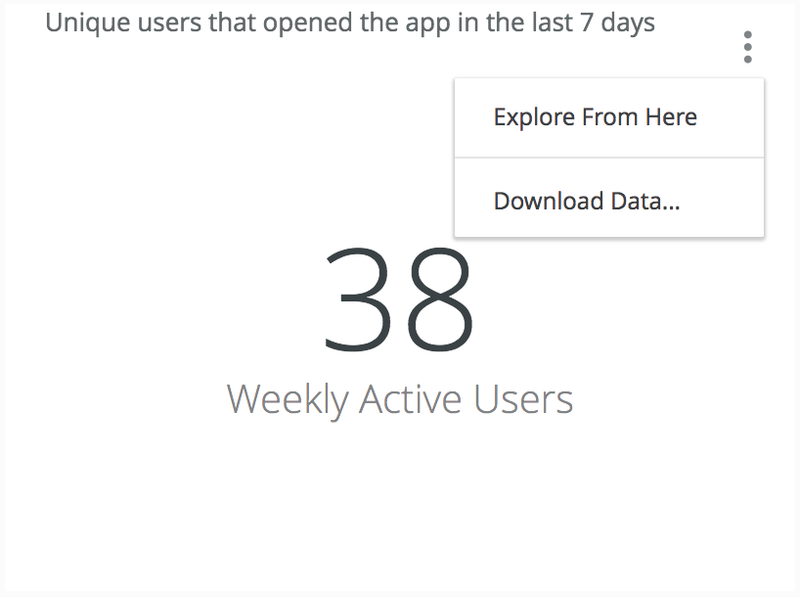 When you create new reports and dashboards, you are prompted to save in a Space. Please read about Spaces before starting this tutorial. Select a report you would like to customize and save. Choose a name for the new dashboard. Save the report to the new dashboard. Set delivery, destination, and format options. Navigate to a dashboard and select a report you would like to customize and save. 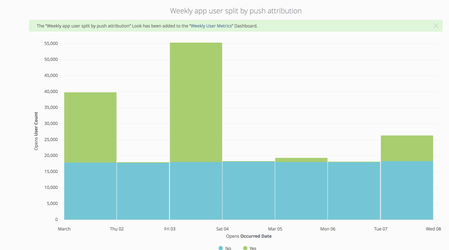 In this example we will select the Weekly Active Users count from the Overview dashboard. Click the ellipsis icon and select Explore From Here. In Opens » Dimensions, click the row for Date. In Message IDs » Dimensions, click the Pivot button for Any Push Attributed (Yes/No). Click the Column Visualization icon. Click the gear icon, then select the radio button for Stacked. Click the gear icon next to the Run button, and select Save and Add to Dashboard. Enter a Title and Description, then choose where to save the content. In this example we will save to the Group space. Click the Save button, and you will be prompted to save to a dashboard. Click the New Dashboard button, enter a name, then click the OK button. Your new dashboard will be listed. Click the Add button. The next screen will show you the saved report in the new dashboard. Click the Spaces menu icon located to the right of the gear icon in the header row of any dashboard or report, and a dropdown menu will appear. On the left side of the menu, select from the Personal, Group, or Shared space icons, then click the name of a listed Dashboard or Report. Filter appropriately so that results are not excessive or a larger data set than necessary. Select a weekend day to limit your impact on other users. If you are interested in integrating with other business systems, we highly recommend using our Connect integrations, which will scale to your needs. See our Partner Integrations. Both dashboards and reports can be scheduled to send data to email, webhook, AWS S3, or an SFTP server. 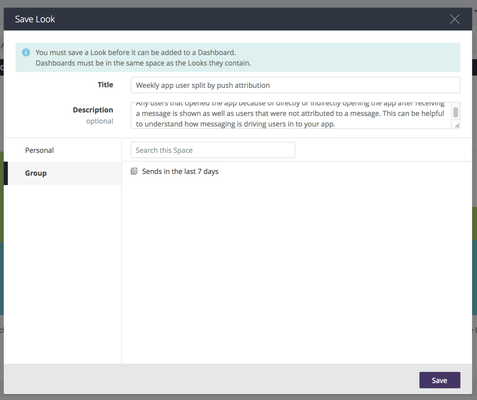 In this example we are emailing a dashboard to a Slack address. See Scheduling Options below for details about destination and format options. Open a saved dashboard from the Spaces menu. Enter a Title, then optionally adjust settings. Repeat: Time and day of delivery repetition. Email: Your account's email address is populated by default. If you have additional recipients, enter the email address, then click the Add button. Follow the instructions to get your Slack-generated email address, then enter it here. Webhook: Enter the webhook URL in the Address field. Amazon S3: Enter the S3 values for Bucket, Access Key, Secret Key, and select a region. SFTP: Enter the host and path, e.g., sftp://mysftp.com/home/ftpuser/, and the SFTP user username and password. Format: Select the data's delivery format. Options are dependent on whether you are scheduling a report or a dashboard, and the selected Destination. See: Scheduling Options. Click the Send Test button to preview before saving. It will send according to the defined Destination settings. The data or visualization is delivered to the email addresses entered. Webhooks are a modern, increasingly common way to trigger exchanges between internet based services. They generally require some technical or developer knowledge to use, but with a product like Zapier, webhooks can let Insight data be delivered to a wide range of locations. Only a webhook URL is required. Limits: If you choose "Results in Table" whatever row limitations you’ve setup in the saved report will be obeyed. If you choose “All Results” all the rows of the query will return, regardless of the saved report settings, and regardless of Insight’s typical 5,000 row limit. This can be desirable for retrieving very large datasets, but you should use caution to ensure the query is not too large for your database. Bucket Name: The name of your Amazon S3 bucket. Path (optional): The folder that you want to save your data too, if any. Access Key: The Access Key ID to your S3 bucket, provided by Amazon. Secret Key: The Secret Acess Key to your S3 bucket, provided by Amazon. Region: The Amazon services region where your S3 bucket is hosted. The Format dropdown menu options vary based on whether you are scheduling a report, or a dashboard, and the selected Destination. The data table of your report as an HTML file attachment. The data table of your report as a tab-delimited text file attachment. The visualization of your report in the body of the email. The data table of your report in the body of the email. The data table of your report as a comma-separated text file attachment. The data table of your report as a JSON file attachment. The data table of your report submitted directly in the webhook request. The data table of your report as an Excel file attachment. Insight does not apply any special formatting of your query results, such as rounding long numbers or adding special characters your Insight developers may have put in place. This is often preferred when data is being fed into another tool for processing. 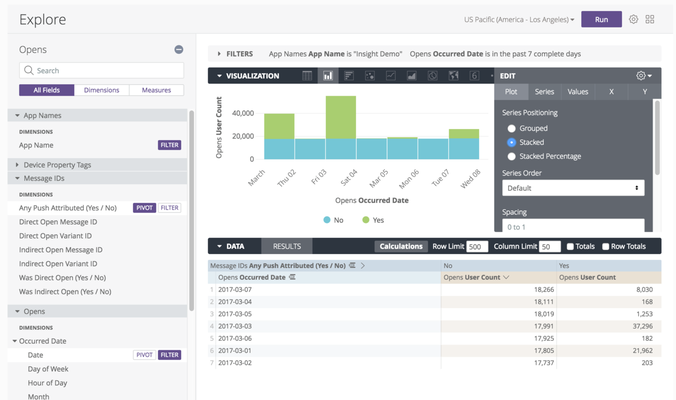 The data will appear more similar to the Explore experience in Insight, although some features, such as linking, aren’t supported by all file types. Select from the results-based dropdown menu. You can choose to send a report only if there are results, there are no results, or in either case. 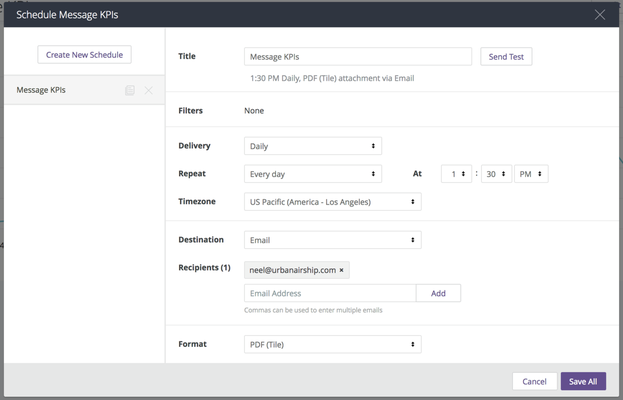 This option lets you only receive emails when the filters of your report are met or not met. Optionally check the box for and results changed since last run. This option help cuts down on unnecessary emails. 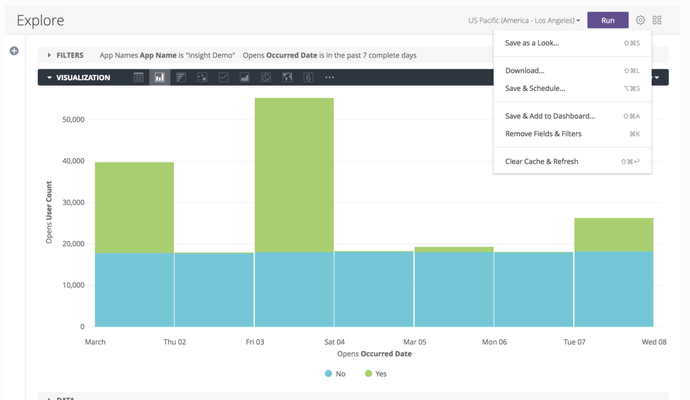 Insight will send an email only if the query results have changed since the last email was sent. Selecting the radio button for All Results will override checking the Send if option to include results changed since last run.